Shakespeare knew better than any other playwright to put the great theatrical challenge: the representation of the invisible. Staging Macbeth is a double challenge: to adapt to the scene a text of great poetical density and to stage a tragedy where the intervention of ghosts and spirits – manifestations of the supernatural world which influence men – dominate all the action. Macbeth is a bloodstained drama, drowned in darkness, trespassed by screams of horror. The play is surrounded by a thick mist, where the apparitions confuse the reality of things and the forces of evil, relentlessly invoked, materialized in terrible ways. Yet, despite having to face an impalpable and terrible enemy, Macbeth is not a victim of a sealed fate. Shakespeare, very clearly, shows us in this tragedy that man is free; it is he who chooses or refuses evil. Everything is dark in this story where the sun never shines. No other dramatic work has managed so well to appropriate the theme of the night. Macbeth is the omnipresence of the night. Night of the murder, dark night propitious to damned thoughts, night of the ghosts, of the somnambulism and of the hallucinating visions, night of the encounters with dangerous otherness, wild night, traversed by screams and cries of death, sinister night, full of “its black agents”. Thus, the night is the place par excellence of this play. The place of otherness. However, it is on another territory that the true nocturnal adventure of Macbeth takes place. The encounter with the witch, a character of a “beyond” present here, brings to his memory “things forgotten” in the darkness of a soul that has the prescience of evil. The witch favors the encounter between the word of the supernatural apparition and the inner intuition of the character. Macbeth is the nocturnal side of man, prisoner of his own wishes, driven to the crime, to despair and to the awareness of his own fall. Shakespeare wrote in a language that was dense and full of images. His texts have an incredible dramatic and poetic force, a density that is present in the characters, their relationships, in the thought woven into the fabric of the language. Adapting and translating means to make choices. Originally, there are in about thirty characters of Macbeth. In order to enact the play with seven actors, the adaptation reduced their number and “revisited” the scenes. In our adaptation, we explore the text trying to respect the coherence of the narrative, the evolution of the characters, the environment of the play, and the richness of its language. Fidelity to the written text was not our primary concern, in accordance with the company’s line of work. For us, the text is a dynamic matter with which we are confronted, open to all possibilities of staging that a long process of work can bring. We believe that staging Shakespeare consists in, first of all, making his play live. Even though we remained in touch with the experience of the past, in the rehearsal room we moved forward with the idea that when we confront the text with the stage it would not help to think about the author, to analyze his intentions, or his time. The written text can only come to life when it meets today’s human being, when it becomes a meeting point between actors and spectators. What makes Macbeth always up-to-date is the fact that it deals with a universal human issue. The focus is man, regardless of his time or his culture. In this staging, we did not try to restore the historical and geographical context of the play, or to create a “modern” context. Numerous cultures inspired us: we went from Caucasus to Korea, from the Arab world to the austerity of the Orthodox world. Our point of arrival draws from all of these sources. We sought to create a theatrical reality towards a theatrical Scotland, evoking a universe different from the one in which we live, but in which we can recognize ourselves. 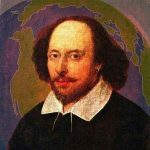 By making the supernatural world intervene in the play, Shakespeare forced us to seek the true path of theater, which is the path of imagination. The Elizabethan scene did not have a scenery and images could come and go as they were evoked by the actors. The theater of Shakespeare is the theater of the actor, it is the actor who has to occupy the center of the scene with his imagination, his body and his emotion. The author has led us to the extreme of the empty stage, focusing all our attention on the characters. This staging is the result of a long work. It is the result of our encounter, our resources, our doubts, and our playing. When we start a new project, we follow to the letter what what the late French playwright Jacques Copeau sugggests: before the play we will work with we do not ask ourselves what to do with it, but what it will make of us. What is at stake is a human adventure. It begins with the encounter with the people who have given shape to this project and it extends to the encounter with the public that justifies it. The projects of Amok are, above all else, projects of a theater company. With the Govern of the State of Rio de Janeiro Prize (Prêmio Governo do Estado do Rio de Janeiro) for the show “The Executioner” (O Carrasco) in 2001, we could invest in our own headquarter, ensuring the existing of the company. The “House of Amok” (Casa do Amok), in the neighborhood of Botafogo, in Rio de Janeiro, made it possible to undertake a project such as Macbeth. The space is to the actor what the instrument is to the musician or the canvas to the painter. It is the support on which his expression may appear. When it comes to composing a play, we use the term “dramaturgy” (from Greek, dramatourgos – “drama”, act, and “ergos[CS1]”, work). Thus we can say that the composition of the play is the work over the act, over the actions. In theater, we usually use the term dramaturgy to designate the work of the writer, the playwright. But there are three levels of dramaturgy: literary, representative, and theatrical, and each corresponds to one subject. On the literary level, the author composes the written word and through it he brings the action. On the representative level, the actor composes vocal and physical actions. The gesture and the spoken word are the substance. And on the theatrical level, the stage director composes the scenic actions. The work of Amok Theater places the representative level in the foreground. This approach is based on two axes: Antonin Artaud and Etienne Decroux from whom we also inherited a technique which is specific to the work of the actor, the dramatic corporeal mime. It is in the confrontation of their theories and practices that we focus our experimentation. Based on different motivations, these two men have much in common: the body and the physical language as center of the theatrical act, the refusal of commercial theater and the affirmation of the scene as a ceremonial space. Regarding the method of work, Arianne Mnouchkine and the Théâtre du Soleil are the other major sources: “Discovering everything in an unceasing work of imagination”. It is always this way we begin working: the actor and the empty scene. A text suggests actions that are loaded with a psychophysical charge. The stage director helps the actor work them in a simple and straightforward way, always leading him to a situation of play, of improvisation. It is not the psychological appropriation of a role, but rather its physical appropriation. In order to remove the text from literature and take it to the theater the text must, besides materializing in precise actions, impregnate itself with improvisation. It is improvisation that allows the actor and the play to remain alive. As a result, the actor interacts with the text instead of working on a passive execution. The stage director helps the actor develop and fix his score of actions, introduces scenic elements that help enliven his creative work, seeking coherence of the whole work. At this moment, we seek to establish a creative dialogue between the three subjects of dramaturgy. The fact that we use specific technique and method does not allow us to think of staging as being dissociated from the actor training. The training is also connected to the work on oneself. We cannot think of the life of a company without taking into account the ethical project of the group. Staging is a field open to experimentation, research, technical improvement and to this work on oneself. – Strings: Saz (Turkey), Viola da Gamba Tenor (Germany), fiddle (Brazil), 4-String Banjo, guitar – bass / harpe – (made by Carlos Bernard). Winds: Didgeridoo (Australia); t’aep’yongnso-oboe (South Korea), and average basse Suling (Bali); Berrante (Brazil). Highlights from a production of Macbeth (2004) directed by Ana Teixeira and performed by actors from Amok Teatro in Rio de Janeiro, Brazil.